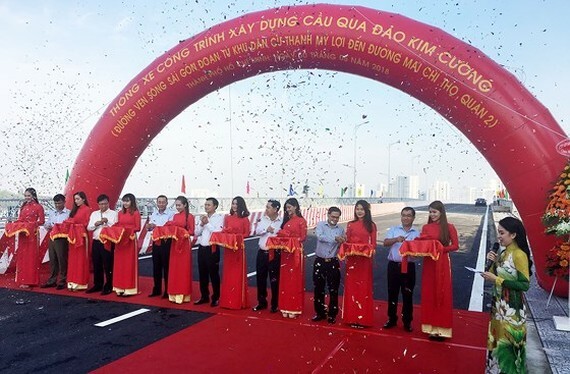 The Ho Chi Minh City Department of Transport this morning officially opened the bridge connecting Kim Cuong Island and Mai Chi Tho Avenue through Thanh My Loi residential area in District 2. Department Head Bui Xuan Cuong said that the bridge will help ease traffic congestion on Mai Chi Tho and Dong Van Cong streets, also in District 2, as there are large numbers of trucks traversing the street to the busy Cat Lai Port. It will connect the residential quarter along Sai Gon River with the Thanh My Loi residential block helping boosting urban construction speed. The VND493 billion (US$21.7 million) bridge with 291 meters long and 22 meters wide is designed for four lanes. A 254-meter embankment and a 416-meter road along the Saigon River were built along with planting trees, and installed lighting systems, among others. The eight-hectare Kim Cuong Island in Binh Trung Tay Ward, District 2 is surrounded by the Saigon and Giong Ong To rivers.